I would be lying if I said that I had a preset travel budget when planning my trip to Iceland. Besides the 8,000 ISK ($65 USD) that I exchanged before my departure and credit card, I winged it. Like everyone else, I heard that Reykjavík was expensive, but I thought, how expensive could it be? Well let me tell you, Iceland is an expensive country, perhaps the most expensive destination I’ve traveled to so far (and I’ve visited twice). Well, maybe Oslo in Norway is actually more expensive. Nevertheless, according to the Backpacker Index which ranks 136 cities around the world from cheapest to most expensive, Reykjavík ranked #135 in 2017, second to Zürich, Switzerland. It’s super expensive to book a hostel, eat out at a restaurant or rent a car in Iceland. But instead of feeling defeated by the high costs, I rose to the occasion. I found lots of affordable things to do in Reykjavik on a budget. The free walking tour with CityWalk Reykjavik was one of the first things I did when I arrived in Reykjavík. This two-hour historic tour offers a great introduction to the capital city and Icelandic culture. The insightful guides are Icelandic history graduates and high school teachers. The tour was fun and engaging. During the tour, visit the most historic parts of downtown Reykjavík including Arnarhóll and Fógetagarður Square. At the end of the tour, set your own price. Tip what you feel the tour was worth – these guys deserve it. You can even tip in any currency you like which is super convenient! Bonus Tip: CityWalk Reykjavik sends you a comprehensive city guide after your tour. Many of the suggestions include free things to do in Reykjavik on a budget. Unless you’re touring Reykjavík with a knowledgeable local or historian, it’s easy to miss the less popular historical sights but Reykjavík is studded with all types of monuments that commemorate founders, leaders and important events in Iceland. Arnarholl Hill & Statue of Ingolfur Arnarson commemorates the first permanent Scandinavian settlers in Iceland. Statue of Leif Eriksson in front of the Hallgrimskirkja Church honors Leif Eriksson, the first European to explore the North Americas. Vikurgardur or Fógetagarður Square is now a public space but it was formerly the home of the old Reykjavík Church and the site of Reykjavík’s oldest cemetery. For the complete list, check out the historic spots in Reykjavik that you probably don’t know about. Highly recommended by Eric (Eiríkur) from CityWalk Reykjavik, I skipped the Blue Lagoon and instead chose a more local bathing experience at Vesturbaejarlaug swimming pool. For more options, check out some of the other affordable swimming pools and hot springs in Iceland. Less than a half an hour walk from the city center, at Vesturbaejarlaug, I enjoyed hot tubs and steam baths alongside locals for 900 ISK ($8 USD). Before entering the pool I had to shower naked (in front of the other female patrons) but it was totally fine. No need to be shy. I did not feel uncomfortable in any way. In fact, bathing at Vesturbaejarlaug was one of the most relaxing experiences I had in Iceland. Nevertheless, I have to warn you, be ready to run for your life when getting out of the water! 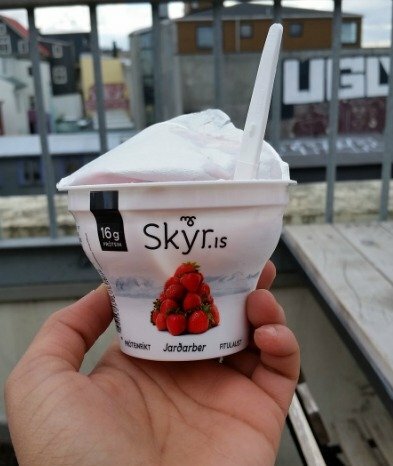 Not to be mistaken for yogurt, Skyr (pronounced skeer) is a dairy product made in Iceland. I loved the light and smooth texture. To save money, I suggest heading to the local grocery store instead of ordering Skyr at a restaurant. Try unique flavors for 200 ISK ($2 USD). You can see the Hallgrimskirkja Church from just about anywhere in Reykjavík. 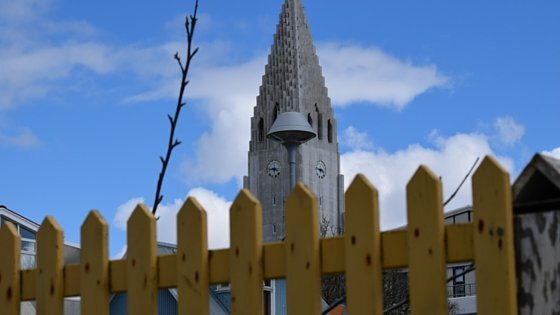 Admission to the church is free but for 900 ISK ($8 USD), climb to the top of the tower and see 360-degree views of Reykjavík, the harbor, and Mount Esja. 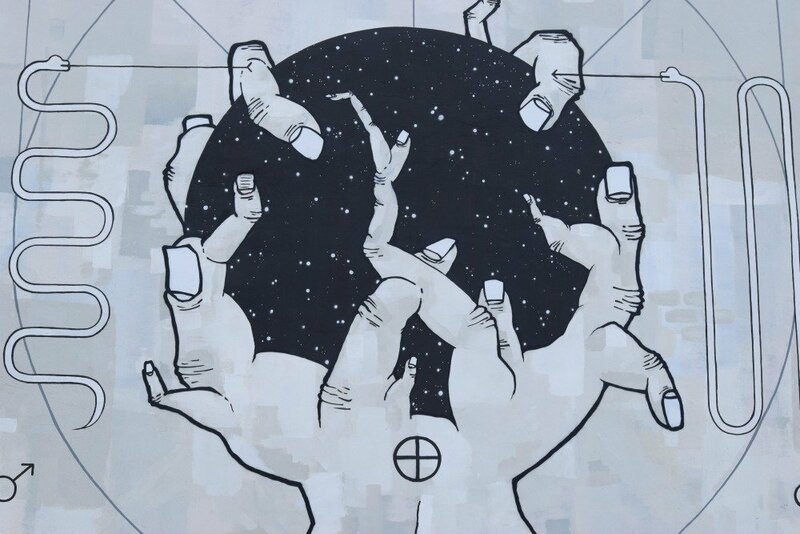 You can find street art all over Reykjavík, just look on the sides of the buildings. Each mural tells a story and makes a bold statement. There are plenty of swans and ducks to admire at Tjörnin so bring your camera. When you’re done, head over to the Reykjavík City Hall. On the main floor, there is an impressive 3D topographic map of Iceland. The Loft Hostel is a great place to meet locals, enjoy live music or take in awesome views of the neighborhood from the patio. They also have Icelandic and Scandinavian beers on tap. If you are into ciders, try the Somersby Cider. Happy hour starts at 4 p.m. and ends at 8 p.m daily. Although alcohol is expensive in Iceland, taking advantage of happy hour specials is a great way to experience Reykjavik on a budget. Speaking of happy hour, download the Reykjavik Appy Hour app and discover all of the happy hour specials happening throughout Reykjavík in real-time. The app displays the establishment’s description, the happy hour duration and prices for drinks. Along the waterfront, visit the Sun Voyager which pays homage to the first Icelanders. Although it looks like a Viking ship, it’s actually a dreamboat following the setting sun. As you enjoy the cool breeze, marvel at the rainbows and a gorgeous view of snowy Mount Esja and snap photos with this iconic Icelandic landmark. What are YOUR favorite things to do in Reykjavik on a budget? 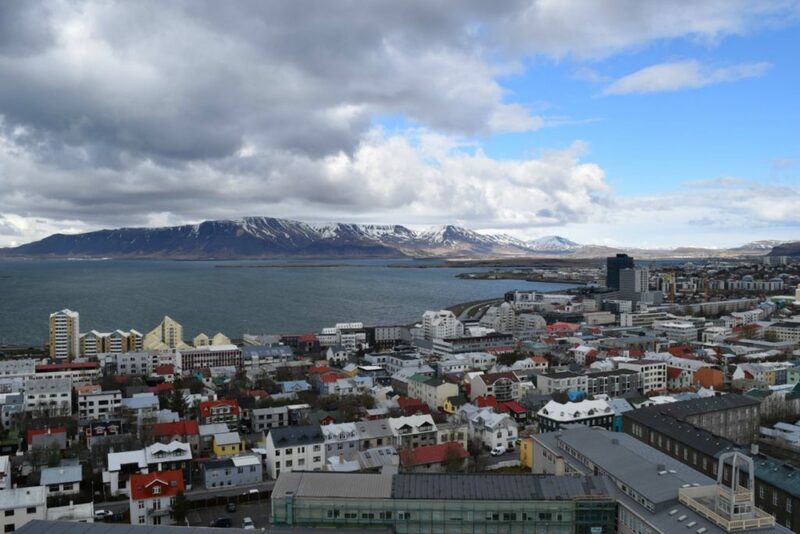 The Reykjavik City Library in downtown also has great views, a free photography exhibit on the top floor, and offers weekly city “ghost” walking tours. Plus, a whole floor of vinyl records and a gorgeous listening station. I’m leaving for Iceland for the first time in a few weeks and your posts were so informative! Thank you!! Like many others, Iceland is on my never ending bucket list. Saving this post, thanks for sharing! it would be super awesome to visit iceland with an unlimited budget but for people like me who travels with a budget, this guide is super helpful! thanks for sharing!! Thanks for the tips on the pools! I’ve looked into them for my so-far-in-the-future-it’s-not-planned trip to Iceland. I also think I’ve seen Skyr in the states. Maybe at Whole Foods? I moved to Colorado not long ago and was just thinking I remember seeing Skyr at Sprouts. Will have to try it! 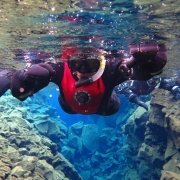 Some great tips here, and glad to see there are lots of cheap options to to have fun in Iceland. Really want to go there soon, will save this for future reference. Great list of affordable options. I’ve seen the Skyr for sale in Sprouts stores in the United States. It’s very good! I love the idea of going to the top of the church for that incredible view! What a beautiful, rugged place! I love that you skipped the expensive tourist destinations and opted for more frugal choices! Going to Iceland in a few weeks! Thanks for the great tips, will def avoid the Blue Lagoon too! Loved this Danielle. I’ve known others that have gone to Iceland before but seeing, and reading about it here really convinced me to add it to the list of ‘definite’ places I want to see. Great photos too! It sure helps, doesn’t it! Try our quiz about Paris to win tickets for the Moulin Rouge show and a VIP Stay in Paris! Great tips, thanks for sharing. I love walking tours. I remember visiting open air swimming pools as amazing experience. Happy travels! Great photos!! Never knew that Iceland had a great art scene! Glad you didn’t let the cost ruin you experience. 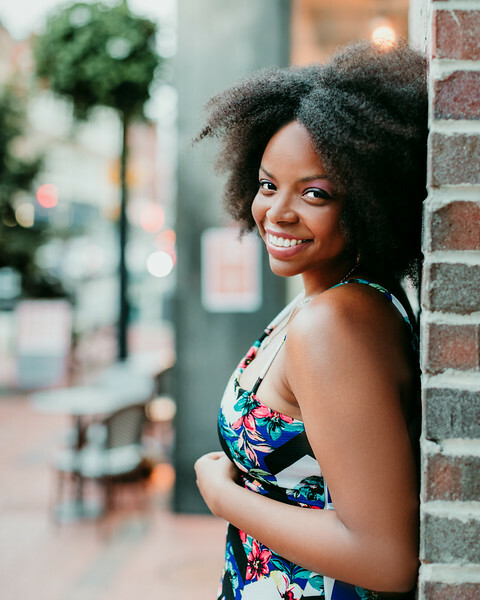 This is a great list you’ve pulled on what to do on a budget. Did you like Reykjavik? 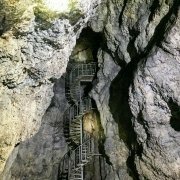 Given the cost, is it worth visiting? I didn’t like Reykjavik… I LOVED it! It is absolutely worth visiting. The food, the nightlife, nature, tons of museums to explore. There is something for everyone here. I would suggest if you are concerned about the cost spend less days, I spent 4 days. Fantastic tips. Reykjavik is on my list of places to visit and I will definitely remember you suggestions. I love all the local pools in Iceland! Such a great treat when you’re travelling and need a break. Reykjavik is such a cool city, you give some great tips on how to experience it on a budget! I think visiting the top of Hallgrimskirkja Church. Thanks for all the recommendations – usually all I see about Reykjavik is the Blue Lagoon, so it’s good to see other things. The view from the top of the Hallgrimskirkja Church looks incredible! I also love street art a lot and did not know Reykjavik had much of that kind of thing, so I love that! I have spent a days wandering around Melbourne just looking at street art and taking pictures, a day well spent (: thanks for the tips! Iceland tops my list mostly because I want to see the Northern lights – Did you happen to see any? I need to probably skip the tour and do it on my own as I will be def on a budget. 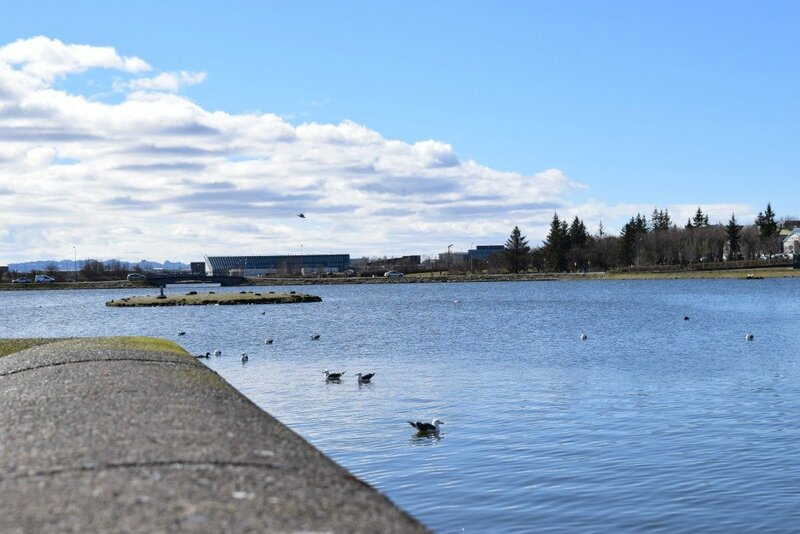 Great tips for Reykjavík here – I never thought I would skip the Blue Lagoon but now I want to do both. Plus walking around and exploring on your own is often one of the best things to do in a new place – and free – so, that’s one thing I rope into my journeys as well. No I didn’t get to see the Northern Lights since I visited in Spring. Northern lights are best seen in the winter. 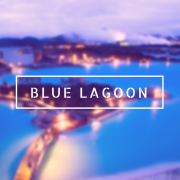 I have no regrets skipping the Blue Lagoon, the local swimming pool was a really nice affordable alternative. Great tips!! The running for your life I totally get as we had to do the same when we got out of the thermal pools in Budapest. It was the middle of winter! I don’t think 1 day is enough time. I did four days and I got to do so much. I would suggest 3-4 days if you are worried about your budget. Iceland looks absolutely beautiful. Love the views. 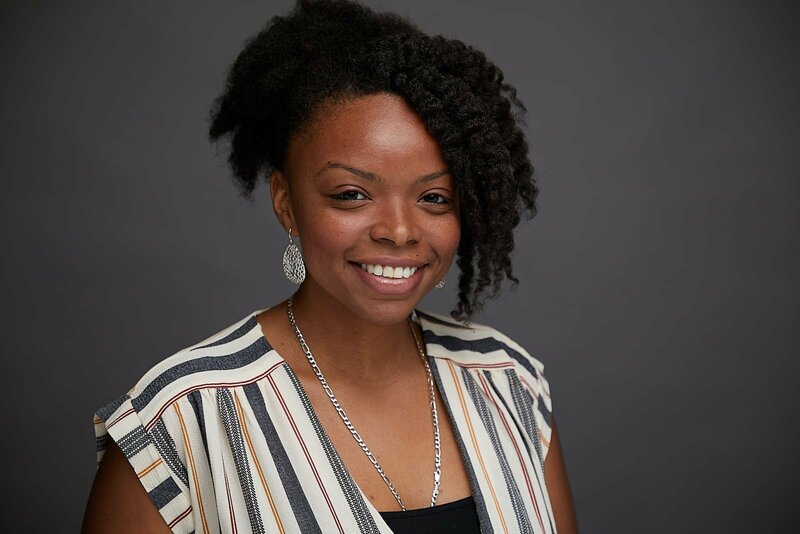 Great tips for keeping things within a budget. There were cities we visited that everyone said was expensive but we always did pretty well, especially with food. We used to just split meals since they always serve way more than you can eat. Then you can splurge on some of the other things to do. Nice – I never thought about splitting meals. This is something I will have to try when I have a traveling buddy #travelhack. Wow what a beautiful place, I have always wanted to go to Iceland! Great tips, number one would be my fav! Lovely images! The CityWalk tour was one of my favorite things I got to do in Iceland, it really helped shape my trip. They also run a pub crawl which is also really cool. The Try Skyr looks so yummy. At first glance, I thought it was frozen yogurt and for only $2! What a deal. Would you say it’s like a yogurt and ice cream combined? I have heard about how pricey Reykjavik can be, and it has made me hesitate. It’s nice to know that there are actually some great things to do there without spending a fortune. I’d love to head out on that CityWalk! Sounds like a fantastic way to see a lot of the city while getting insider info from the guides. 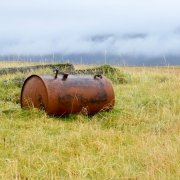 I really enjoyed this post, having recently returned from Reykjavik. It was a fairly expensive city, but there are certainly budget options if you do your research well. You have come up with some great ideas here. Great tips! Europe can be so expensive so it is great to have a list that shows some of the more affordable activities! What this Mom Really Wants As a Solo Traveler Iceland Budget Breakdown: How Much Does 4 Days in Iceland Cost?